Welcome to Cub Scouting and Pack 89. We are honored that you have selected this Pack to participate in the exciting world of Scouting. Direct contact between the pack and the chartered organization, district committee and the local council. Leads the pack committee and thus is responsible for the administration, oversight, and support of the pack program. Ensures proper records are kept within the pack. Plans, coordinates, and leads the annual rechartering process and develops and carries out a plan for year-round membership growth. Ensures the pack’s finances are sound. Helps boys move through the ranks of Cub Scouting and transition into a Boy Scout troop. Plays several roles, including friend, representative, unit “doctor,” teacher, and counselor. 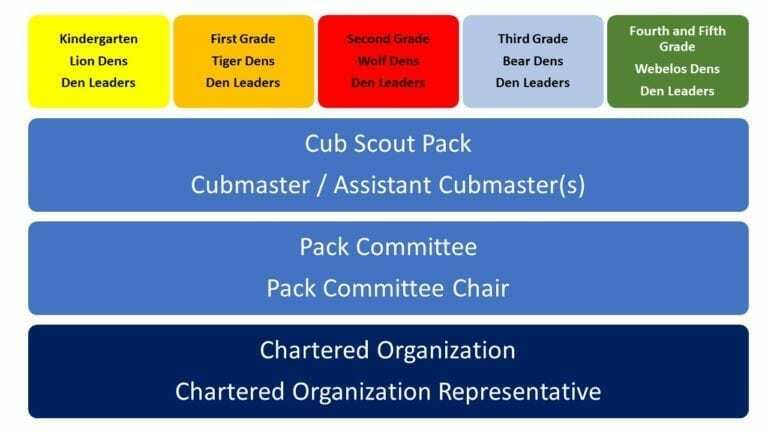 Plans and helps carry out the Cub Scout program in the pack according to the policies of the BSA. Helps the Cubmaster as needed. Be ready to fill in for the Cubmaster, if necessary. Plan, prepare for, and conduct den meetings. Coordinates and runs popcorn fundraising activities. Plans and coordinates activities for the Blue & Gold banquet. Organizes and runs pinewood derby. Helps the Cubmaster plan and arrange for summer activities. ​Helps the Cubmaster plan and arrange for outdoor activities.